During his eight years as the nation's 43rd chief executive officer in the White House, President George W. Bush often jetted about the country and the world aboard Air Force One. Thanks to a special gift from Bass Pro Shops and Tracker Marine founder and CEO Johnny Morris, the former U.S. President and Texas resident can now roam the nation's fishing waters aboard a stylish bass rig dubbed "Tracker Bass Force One." Patterned after Air Force One – and made at the Tracker Marine plant in Lebanon, Mo. 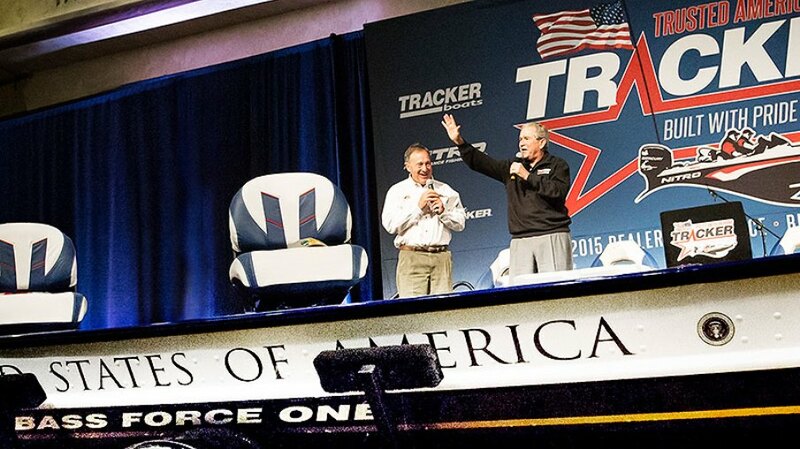 – the boat was presented to Bush on Monday, Sept. 15, 2014, during a surprise keynote speech at the Tracker Marine Conference at Big Cedar Lodge on Missouri's Table Rock Lake. Two decades ago, Bush's father and the 41st president of the United States, George H. W. Bush, made a similar address at the same Tracker Marine convention in nearby Springfield, Mo. 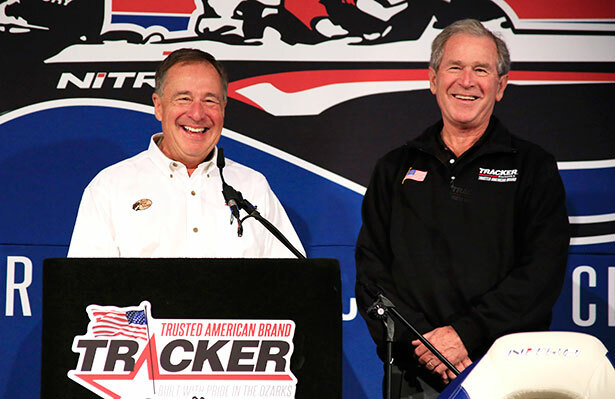 According to a Bass Pro Shops' news release on the event, the younger Bush – an avid outdoorsman and angler like his father – was there at the invitation of Morris. Attendees from all over the United States and from countries around the world including Australia, China, Russia and South Africa heard of Bush's love for the outdoors and the work his administration did to protect water, wildlife habitat and other natural resources. Among other things, Bush and his administration restored, improved and/or protected more than 3,000,000 acres of wetlands and other wildlife habitat through the North American Wetlands Conservation Act. That landmark act continued the Bush family legacy of wetlands protection in the U.S. since back in 1989, the elder Bush established a national policy of "no-net loss of wetlands" during his time in the Oval Office. On Monday, the younger Bush spoke about his administration's commitment to conservation. "We pioneered a new model of cooperative conservation in which government and private citizens and environmental advocates work together,” said Bush. Morris, a longtime friend of the Bush family, pointed to other conservation efforts during Bush's 43rd presidency. Those included an executive order that Bush signed in October 2007 to help conserve two of the nation's most popular recreational fish, the striped bass and the red drum. During the ceremony where Bush signed that executive order nearly seven years ago, the 43rd president remarked that while the fishing for redfish was currently good in his home state of Texas, " ... we want to make it as good as possible all throughout the country, because fishing is important to the country." On Monday, Morris lauded the former president for that commitment to keeping the nation's fishing as good as it can be. “We are inspired by and grateful to Mr. Bush and his father for their shared love of the sport of fishing and for their leadership and commitment to national conservation efforts,” said Morris. During Monday's festivities, Morris and Bush shared fishing stories and laughs with other bass fishing legends including Major League Fishing champion Kevin VanDam, a four-time winner of the Bassmaster Classic title and a seven-time B.A.S.S. Angler of the Year. Also sharing fishing tales with Bush and Morris were legendary bass pros Bill Dance, Roland Martin, Jimmy Houston, Rick Clunn, Charlie Campbell and several others. On the heels of last week's 13th anniversary of the 9/11 terrorist attacks that occurred during his time in office, Bush also took a more somber tone at times and answered questions about his tenure in the White House and his insights as the nation's Commander-in-Chief. Now a bestselling author and a popular speaker, Bush also gave some thoughts about the upcoming release of his new book in November 2014, a volume entitled "41 – A Portrait of My Father." As the festivities concluded for the Tracker Marine Group – which has manufactured fishing rigs such as TRACKER Bass Boats and NITRO Bass Boats during its 36 years in business – the crowd of Bush, Morris and others adjourned for lunch at the nearby Arnie's Barn eatery. It was a lunch where presumably even more fishing tales were told by the nation's Fisherman-in-Chief and his colleagues and friends. Because even a former president of the United States loves to talk about fish and fishing trips with his angling pals, especially when a few of those are the best that the sport has ever seen. And that leads to this writer's thought: Oh to have been a fly on that wall.